Home » Sports » SPHS Female Football Team are 2018 Northern Regional Champs! 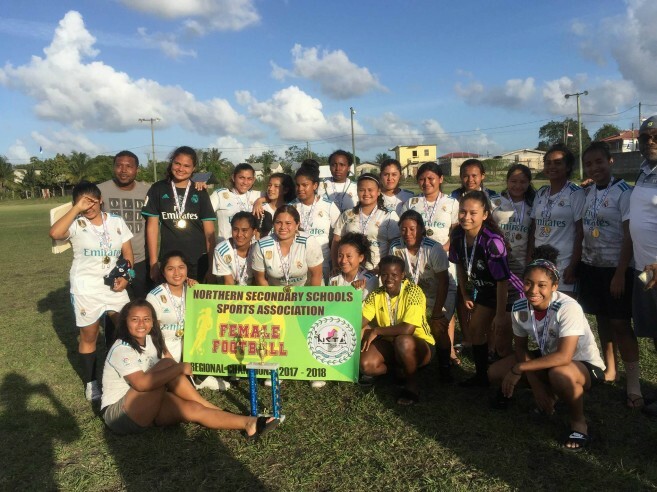 The San Pedro High School (SPHS) female football team once becomes the Northern Regional Football Champions on Saturday, February 10th at the National Secondary Schools Sports Association (NSSSA) competition. Held at the Louisiana Field in Orange Walk Town, both male and female football teams from SPHS competed against other schools for a spot in the National tournament to be held on March 2nd, and 3rd in Punta Gorda Toledo District. 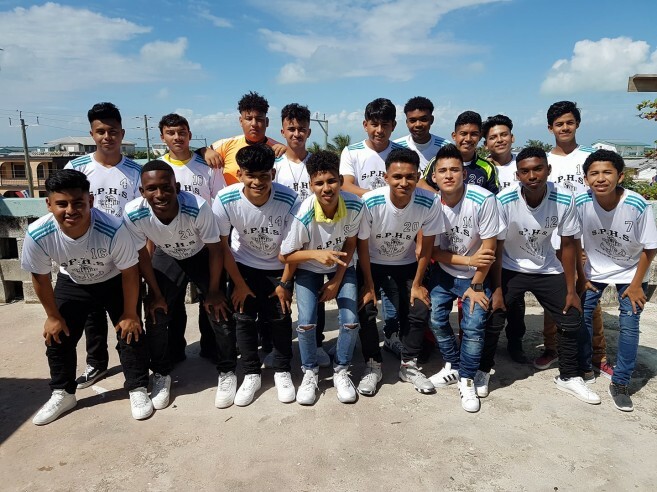 In the male division, the SPHS played against Corozal Community College (CCC). The island boys met a very challenging opponent, who dominated the game for most of the 90-minute match. Despite a leading score from CCC, the SPHS still managed to walk away with the victory in a 2-1 final score. The island team then advanced to the championship match against Orange Walk Technical High School (OWTHS). The grueling match threatened to end scoreless as both teams’ defenses efficiently defended goal attempts. But near the final minutes, the OWTHS scored a goal for a solid lead that left the SPHS team out of the competition. With a tight 1-0 score, the OWTHS male football team secured its ticket to the national competition. Meanwhile, the SPHS female team took on Bishop Martin High School in their first grueling match that saw the best of both teams. The team from Bishop Martin was determined to win, however, SPHS’ females dominated the match defensively. After a while, SPHS switched to offensive play yielding the only goal of the match. The female island team advanced to the championship game of the NSSSA. The final game saw SPHS girls playing against Belize High School of Agriculture (BHSA). The island team was again on the defensive with a couple offensive bursts as they tried to open the scoreboard. BHSA, fought back denying SPHS any opportunity to score, while they tried to beat SPHS’s defense. But the SPHS left no room for BHSA to score and in the unique opportunity the island girls scored the only goal they needed. At the end of the long whistle, the SPHS girls won the regionals in a close 1-0 final score. Sports Director at SPHS Paul Kelly, says that the female team is now gearing up for the nationals where they will attempt to bring home the 2018 National Championship. He feels very proud of both teams, and commend the male team for their great effort. Kelly acknowledges that the male teams have had a clean record in the regionals, but he hopes that they can make up the blunders of this year’s competition and improve for next year’s competition. Kelly also commented on the success of the school’s female players. The SPHS female football team won the NSSSA competition in February of 2017 and days later brought home the national title at the national competition. The defending champions are aiming to repeat history and bring home the national title once again. The San Pedro Sun takes this opportunity to extend hearty congratulations to both teams that represented San Pedro at the Northern Regionals and extend our best wishes to the SPHS Girls in the upcoming national tournament. San Pedro boys win Orange Walk Volleyball Tournament!